Last night, we felt like making something that you might see on a menu in a Parisian bistro, so I made this delicious (and apparently classic bistro) chicken dish. To me, it is a cross between Indian and Moroccan flavors, but I’m guessing the influence is mainly Moroccan for historical reasons. Anyway, all of that is good (love the ginger and lemon in it!). 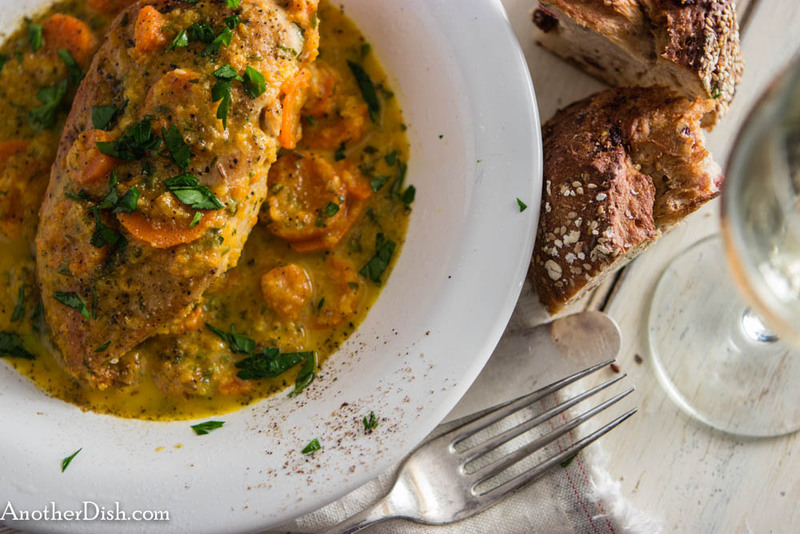 Paired this with a nice pinot gris, simple green beans and nice crusty fresh bread — it’s a wonderful little meal, and I hope you’ll try it tonight! Fill a medium sauce pan 3/4 full with water and bring to a boil over medium-high heat. Add 2/3 of the carrots, and bring back to a boil. Cook until tender, about 5 minutes. Remove from heat, drain and set aside. Heat 1 1/2 Tbsp of the oil in a medium sauté pan over medium-high heat. Add onions and garlic, and reduce heat to low. Sauté gently for 4 minutes. Add ginger and sauté another 1 minute. Add the remaining carrots and stir for 30 seconds. Add the lemon juice, chicken stock, cumin seeds, 1 tsp of the salt and 1/4 of the pepper. Bring to a boil. Cover, reduce heat to low and simmer 6 minutes. Pour contents into a food processor and process until smooth, about 2 minutes. Pour the carrot sauce through a fine sieve into a bowl (discarding any solids) and return to sauté pan. Stir in the reserved boiled carrots and the parsley, and bring to a boil. Reduce heat to very low, cover and keep warm while you prepare the chicken. Heat remaining 1 Tbsp oil in a large sauté pan over high heat. Rub remaining 1 tsp salt and 1/4 tsp pepper all over chicken breasts. Add chicken to pan and cook on one side for 8 minutes. Turn breasts over and cook an additional 5 minutes, or until no longer pink in the middle. Transfer chicken to the carrot sauce and turn over a few times to coat. Place each chicken breast in a bowl and ladle the sauce over each. Garnish with additional chopped parsley, if desired. Serve with fresh bread. This entry was posted in Chicken, French, Main Dishes, Moroccan and tagged Comfort Food, Cooking, Food, Food Photography, Foodie, French Food, Recipes on December 17, 2014 by AnotherDish. Thanks so much for the nice comment, Ema. I’m crazy about chicken, as well! Yeah, I can have it 3 times in a day 🙂 , the craving is on and on..